Healthy and exuberant before the installation, deBac became unable to sleep normally. She soon became exhausted and tearfully anxious as she struggled with rashes and a chronically racing heart. For respite she spent nights away in her car. One of her dogs died of cancer within six months of the meter’s installation and the other developed large tumors. Today Cindy leads a global educational crusade to warn others about the myriad devastating health effects that electromagnetic radiation can unleash. The AMI “smart” meter below records electrical consumption data and sends the information wirelessly to energy system managers. “Smart” meters can be programmed to read and transmit data monthly, or up to every fifteen seconds. Data may be relayed by systems similar to mobile phones or Wi-Fi. Or information may be relayed via fiber optics (thin, transparent cables that carry signals by pulsing light). Of these methods, fiber optics may offer the safest transmission. AMI is nested within the American Recovery and Investment Act of 2009, and the Obama Administration has shoveled an estimated eleven billion dollars into incentive programs for utilities that participate. “Smart” grid advocates insist that the new two-way meters will reduce national energy consumption and allow consumers to make better choices about their energy needs. The Department of Energy (DOE) and the U.S. Department of Agriculture (USDA) are among federal heavyweights behind the thundering AMI rollout. Several universities and corporations stand to profit hugely by providing AMI equipment, software and expertise. These include General Electric, IBM, Hewlett Packard, Siemens, Toshiba, Microsoft, Cisco, Verizon, Google, Itron and Tantalus. With a financial and political engine of this magnitude, the AMI meter replacement project has moved at lightning speed. According to the Institute for Electric Efficiency (IEE), nearly 40 percent of U.S. households had an electric “smart” meter installed by August 2013. A total of sixty-five million “smart” meters are projected to be installed by 2015, covering more than half of all U.S. households.1 Among states hit hardest so far have been Oregon, Idaho, California, Nevada, Arizona, Texas, Oklahoma, Maryland, Virginia, Indiana, Ohio, Pennsylvania, Michigan, Vermont, Florida, Georgia and Alabama. Over the last three years, strong-arm installation tactics, fires caused by meters, skyrocketing utility bills, privacy concerns and disabling health effects have given momentum to a broad coalition of “smart” grid opponents. Many, including some government officials, say that the touted benefits of “smart” systems have not materialized, while the negative ramifications have proven disastrous. But at what price? The cost of the “smart” meter program is breathtaking. By some estimates, utility consumers will pay at least two hundred twenty-five billion dollars to blanket the nation with AMI meters. A “smart” electric meter can cost hundreds of dollars per household. The attorney general of Massachusetts projected the cost of each meter in that state at almost three thousand dollars.6 Some AMI equipment manufacturers suggest that meters may need to be replaced as often as every three years to keep up with technical innovations.7 This would force consumers to continually pay for new hardware that they are coerced to accept. Critics say that when time-of-use pricing goes into effect, utility bills could become insurmountable for many customers (unless they learn to direct their peak energy usage to the middle of the night). Left: An EMR-emitting device attached to a telephone pole. Right: A cell tower. Since microwaves easily flow through most construction materials, “smart” meters attached to the outside of homes (or huge banks of them on multi-unit dwellings) broadcast a perpetual barrage of Group 2B radiation directly into the interior of inhabited buildings and right through all human flesh within range. By early 2011, the California Public Utilities Commission had received over two thousand health complaints from PG&E customers and the complaints escalated from there. By the end of 2011, multiple California cities had either banned smart meters or had placed a moratorium on continued installation. Currently, many California communities are still in AMI limbo, while communities in other states also struggle to find their way. Due to public uproar, some utility companies unleashing “smart” meter systems are offering opt-out programs. Opt-out often requires those who refuse “smart” meters to pay one or more fees for the right to keep their older and safer analog meters. Some complain that the fees are reminiscent of extortion from old-time protection thugs. Requesting an opt-out is definitely a first step to protecting one’s own home from harmful, microwave emissions. But it does not address exposure to EMR from neighboring meters, or from mesh pole transmitters on the grid. EMR from some meters can be measured over three hundred feet away. A single-family home in a residential community can be well within three hundred feet of several near and next-nearest neighbors. Thus, even at the distance of a football field, EMR from many surrounding meters could prove biologically significant, even for those who retain their analog meters. Residents of townhouses, condos and apartment buildings may be especially vulnerable when ten or twenty meters or more are installed on one wall. Also, an opt-out does not resolve the hazards of dirty electricity polluting a neighborhood loaded with AMI meters. Nor does it protect people who don’t have enough information to request an opt-out, but who may one day develop illnesses from EMR exposure. Living in rural areas does not solve the problem. Some rural utilities serving mountainous and/or forested areas may choose to deploy AMI metering solutions like those provided by Tantalus Systems Corp. Tantalus creates hybrid “smart” antenna systems, utilizing a variety of frequency signals that can travel through and around obstacles in their quest to “connect.”18 As with other frequency fields deployed by AMI, no studies of the biological effects of such public exposure have been conducted. Most upcoming smart appliances will be using the Wi-Fi frequencies of 2.4 or 5 GHz. They will create a wireless home access network (HAN) similar to residential Wi-Fi systems. Smart appliance HANs will broadcast microwave radiation 100 percent of the time. Within a typical house full of radiating appliances, there will be no location out of broadcast range. It is anticipated that smart appliance turn-off will be available only at the circuit breaker. Those with access to “smart” meter and “smart” appliance data, including government officials, law enforcement agents, and professional hackers/thieves, can review a permanent history of household activities, then complete a calendar with time-of-day metrics to gain a highly invasive and detailed view of occupants’ lives. Because smart meters can individually identify electrical devices, personal information made obvious to snoopers can include medical conditions, sexual activities, the physical location of persons within the house, and vacancy patterns. There is a smart grid initiative in almost every industrialized nation. The fact that AMI has been deployed worldwide makes the entire “smart” power grid especially vulnerable to cyber attacks. As AMI progresses, the vulnerability of the Internet is being transferred to entire national grids. ALTERNATIVE GREEN ENERGY SYSTEMS SUPPRESSED? The documentary film Take Back Your Power introduces evidence that the vested interests coercing the AMI systems upon our nation are the very same forces which are suppressing cleaner and more sustainable energy technologies. One path to the suppression of competitive technologies is apparently through the U.S. Patent Office. The Commissioner of Patents can order inventions and technologies to be kept secret indefinitely. At his discretion, he can deny any patent or withhold the publication of any patent application. By the end of fiscal year 2011, there were over five thousand Patent Office secrecy orders in effect, according to the Federation of American Scientists.26 It is believed by some scholars that among these many submerged patents are several clean and viable energy technologies which are perceived as a threat by the powerful oil, gas and fracking networks. Ironically, the “smart” meters themselves use considerable energy in order to perpetually signal the mesh system. In addition, millions of “smart” appliances will be always “on” and always communicating with meters, thereby causing more use. The formidable challenges presented by AMI smart technology lead back to the dilemma of national priorities. How much money and wellbeing should we sacrifice to achieve a tiny reduction in national energy consumption fifteen years from now? 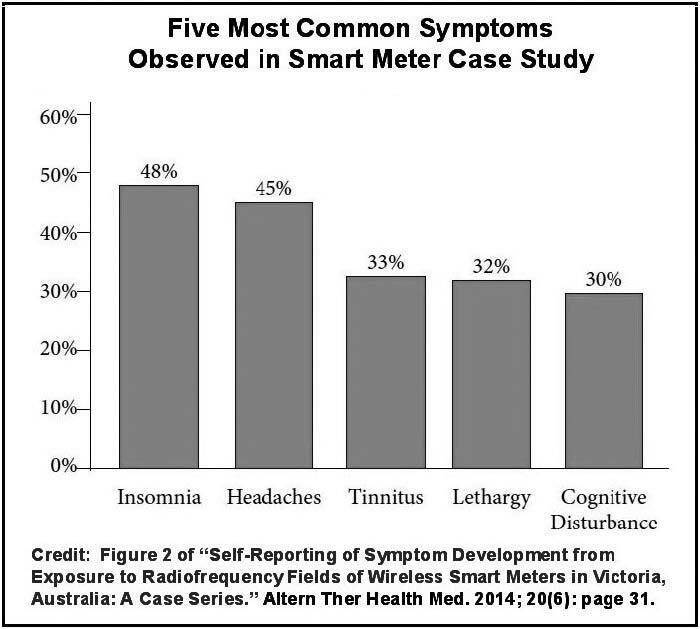 Media sources continually report on many people suffering from electro-hypersensitivity (EHS) who have fled their smart-metered homes in desperate search of habitation that does not cause heart palpitations, rashes, severe tinnitus and/neurological disabilities. Electro-sensitivity appears to be a sort of auto-immune condition developed by a growing number of victims, usually after acute exposure to electromagnetic radiation. The National Institutes of Health confirms the fact that all cancer begins with damaged DNA. In a nation with fourteen million cancer victims and 1.6 million new cancer cases diagnosed each year (not counting millions of skin cancers), exposure to EMR from wireless technologies matters to everyone’s health. Public awareness is a first step toward forging solutions to the many challenges of the “smart” grid conundrum. We need citizens, legislators and regulators concerned about health. We need “smart” meters recalled and analog mechanical meters restored. We need to stop deploying any new technologies until they are proven harmless. It is truly wise to become educated on all of these vital issues. We must be proactive in order to understand what utility companies are planning for our individual neighborhoods and for our states. In these challenging times, vigilance and reliable information empower us to prevent suffering and protect everyone’s health. The BioInitiative Report 2012 updates the last five years (2007-2012) of science, public health, public policy and global response to the growing health issue of chronic exposure to electromagnetic fields and radio frequency radiation in the daily life of billions of people around the world. The Report has been prepared by 29 authors from ten countries, including ten medical doctors, twenty-one PhDs, and three MsC, MA, or MPHs. Among the authors are three former presidents of the Bioelectromagnetics Society (BEMS), and five full members of BEMS. One distinguished author is the chair of the Russian National Committee on Non-Ionizing Radiation. Another is a senior advisor to the European Environmental Agency. The great strength of the BioInitiative Report (www.bioinitiative.org) is that it has been carried out independently of governments, existing bodies and industry professional societies. Precisely because of this, the BioInitiative Report presents a solid scientific and public health policy assessment that is evidence-based. The global conversation on why public safety limits for electromagnetic and radio frequency fields remain thousands of times higher than exposure levels that health studies consistently show to be associated with serious health impacts has intensified since 2007. Roughly eighteen new studies have been published in the last five years reporting effects at exposure levels ten to hundreds or thousands of times lower than allowed under safety limits in most countries. Yet no government has instituted comprehensive reforms. Some actions have been taken that highlight partial solutions. The Global Actions chapter presents milestone events that characterize the international “sea change” of opinion that has taken place, and reports on precautionary advice and actions from around the world. The world’s populations—from children to the general public to scientists and physicians—face an intensifying barrage from corporate marketing propaganda that urges the insertion of the latest wireless devices into their everyday lives. This occurs even while even an elementary understanding of the possible health consequences of using these devices is beyond the ability of most people to grasp. Exposures are invisible and testing meters are expensive and technically difficult to operate. The technology industry promotes new gadgets and generates massive advertising and lobbying campaigns that silence debate, while the reliable, non-wireless versions are discontinued against public will. There is little labeling, and little or no informed choice In fact, there is often not even the choice to stay with safer, wired solutions, as in the case of the “smart grid” and “smart” wireless utility metering, an extreme example of a failed corporate-governmental partnership strategy, ostensibly initiated for energy conservation. A collision of the wireless technology rollout and the costs of choosing unwisely has begun and will grow. The groundwork for this collision is being laid as a result of increased exposure, especially to radio frequency fields, in education, housing, commerce, communications and entertainment, medical technologies and imaging, and in public and private transportation by air, bus, train and motor vehicles. Special concerns are the care of the fetus and newborn, the care for children with learning disabilities, and consideration of people under protection of the Americans with Disabilities Act, which includes people who have become sensitized and physiologically intolerant of chronic exposures. The 2012 report now addresses these issues and presents an update of issues previously discussed in the BioInitiative Report 2007. The stakes are very high. Human beings are bioelectrical systems. Our hearts and brains are regulated by internal bioelectrical signals. Environmental exposures to artificial EMRs can interact with fundamental biological processes in the human body. In some cases, this may cause discomfort, sleep disruption, loss of wellbeing (impaired mental functioning and impaired metabolism), or sometimes a dread disease like cancer or Alzheimer’s disease. It may interfere with fertility or successful full-term pregnancy, or result in brain development changes that harm the child. It may be these exposures play a role in causing long-term impairments to normal growth and development in children, jeopardizing their futures as healthy, productive adults. We have good evidence that these exposures can damage our health, or that of children of the future who will be born to parents now immersed in wireless exposures. In the U.S., the deployment of wireless infrastructure (cell tower sites) to support cell phone use has accelerated greatly in the last decades. The spread of cell towers in communities—often placed on preschool, church, daycare, and school campuses—means that young children receive thousands of times higher RF exposures in home and school environments than existed even 20-25 years ago. CTIA estimates that in 1997 there were 36,650 cell sites in the U.S. This number increased rapidly to 131,350 in June 2002, 210,350 in June 2007, and 265,561 in June 2012 (CTIA, 2012). These wireless antennas for cellular phone voice and data transmission produce whole-body RFR exposures over broad areas in communities—an involuntary and unavoidable sources of radio frequency radiation exposure. Further, the nearly universal switch to cordless and cell phones from corded landline phones means close and repetitive exposures to both EMF and RFR in the home. Other new RFR exposures come from Wi-Fi access points (hotspots) that radiate continuously in cafés, stores, libraries, classrooms, on buses and trains, and from personal Wi-Fi enabled devices (such as iPads, tablets, and PDAs). The largest single source of community-wide, pervasive RFR yet rolled out is the “smart meter” infrastructure. This program places a wireless device (like a mini-mobile phone base station) on the wall, replacing the electromechanical (spinning dial) meter. They are to be installed on every home and classroom in every building with an electric meter. Utilities from California to Maine have installed tens of millions already, despite the deep alarm of experts and enormous public resistance. The wireless meters produce spikes of pulsed radio frequency radiation continuously, and in typical operation, will saturate living spaces at levels that can be much higher than those already reported to cause bioeffects and adverse health effects (utilities can only say they are compliant with outdated federal safety standards, which may or may not always be true—see http://sagereports.com/smart-meter-rf). These meters, depending on where they are placed relative to occupied space in the home or classroom, can produce RFR exposure levels similar to those within the first 100 feet to 600 feet of a mobile phone base station (cell tower). The cumulative RFR burden within any community is largely unknown. Both involuntary sources (like cell towers, smart meters, and second-hand radiation from the use of wireless devices by others) plus voluntary exposures from personal use of cell and cordless phones, wireless routers, electronic baby surveillance monitors, wireless security systems, wireless hearing aids, and wireless medical devices like implanted insulin pumps, all add up. No one is tallying up these combined exposure levels. Billions of new RFR transmitters from the “smart” meter rollout alone will raise the baseline RFR levels and add significantly to the existing RFR background. Do we know enough to take action? There is more evidence than we need. Over the last five years, new scientific studies indicate the situation is much worse than in 2007 and yet people around the world have so much more daily exposure than even five years ago. Exposures are linked to a variety of adverse health outcomes that may have significant public health consequences. When considering billions of people world-wide, no argument to maintain the status quo can be persuasive now. In twenty-one technical chapters of the BioInitiative Report 2012 update, the contributing authors discuss the content and implications of 1800 new studies. Overall, there is reinforced scientific evidence of risk where there is chronic exposure to low-intensity electromagnetic fields and to wireless technologies (radio frequency radiation including microwave radiation). There is more evidence in 2012 that such exposures damage DNA, interfere with DNA repair, and are hazardous to the nervous system. More and better studies on the effects of mobile phone base stations (wireless antenna facilities or cell towers) report lower RFR levels over time can result in adverse health outcomes. An increasing number of studies have examined the effects of wireless laptops as well as cell phones worn on the belt or in the pocket of men on sperm quality, motility, and sperm death. A dozen new studies focus on the fetus, infant and young child, and child-in-school. The levels of exposure we face in 2012 are higher, and have crept into everyday life, even for children. The levels at which undesirable effects on health and well-being are seen is much lower. There is much greater involuntary exposure, and it is nearly unavoidable even for people who choose not to “go wireless” via second-hand radiation effects. Safe forms of communication by land-line telephone are being phased out without general public knowledge or agreement. There is no informed consent for consumers (warning labels on cell phones, for example, have been defeated by telecom industry lobby groups). It is still difficult or impossible for consumers to get reliable information on levels of exposure from wireless devices. It is simply beyond the reach of people to identify where excessively high levels of exposure occur in their communities, and it is very rare for a county or state health department to accommodate requests for information or provide measurements. The range of possible health effects that are adverse with chronic exposures has broadened. The most serious health endpoints that have been reported to be associated with extremely low frequency (ELF) and/or radio frequency radiation (RFR) include childhood and adult leukemia, childhood and adult brain tumors, and increased risk of Alzheimer’s and amyotrophic lateral sclerosis (ALS). In addition, there are reports of increased risk of breast cancer in both men and women, genotoxic effects, pathological leakage of the blood–brain barrier, altered immune function including increased allergic and inflammatory responses, miscarriage, and some cardiovascular effects. Insomnia is reported in studies of people living in very low-intensity RFR environments with Wi-Fi and cell tower-level exposures. We could do otherwise. Each wireless version had a wired counterpart with none of the wireless-associated health effects. It is time to re-think the wireless tsunami and educate people about health, privacy and security risks. It is past time to develop new safety standards. Now we must look to less harmful ways to communicate, move ourselves from place to place, shop, sleep, recreate, save energy and educate our children in school. Adapted from the 2012 BioInitiative Report and reprinted with permission. Jerry Day posts the following letter on jerryday.com for anyone who chooses to refuse installation of a “smart” meter on their residence or property. He suggests that you consult your attorney to tailor the letter to your specifications, then send your revised version to your utility company’s CEO or president by certified mail. Keep copies of your letter and your certified mail receipt. If anyone attempts to install a transmitting meter on your residence, show them the copy of your letter and proof of its delivery (your certified mail receipt). Tell them that installing a transmitting meter on your residence will thereby be a criminal trespass. If they attempt this, you will call the police, request that the installer be taken into custody, and file a criminal complaint with the police. If the company responds to your letter in writing, Jerry Day suggests that you write back. Remind them that they have not proven that they may lawfully install any radiation-emitting surveillance device on your residence. NOTICE OF NO CONSENT TO TRESPASS, SURVEILLANCE OR RADIATION POLLUTION. NOTICE OF LIABILITY. ADHESION CONTRACT. 1. They individually identify electrical devices and record when they are operated, causing invasion of privacy. 2. They monitor household activity and occupancy in violation of rights and domestic privacy. 3. They transmit wireless signals that are interceptable by unauthorized and distant parties. 4. No power company or other individual agency has consent to conduct surveillance or monitoring or to emit radiation (EMR) on our property or residence with a digital meter. 5. Those with access to the data can review a permanent history of household activities taken and viewed unlawfully and without the consent of occupants and subjects of the surveillance. 6. Those databases may be shared with, or fall into the hands of, unauthorized law enforcement, private hackers of wireless transmissions and other unidentified parties for use against the interests of the energy subscribers and the occupants of the structures. 7. “Smart” meters are, by definition, surveillance devices that violate federal and state wiretapping laws by recording and storing databases of private and personal activities and behaviors recorded without the consent or knowledge of those people who are monitored. 8. It is possible, for example, with analysis of certain “smart” meter data, for unauthorized and distant parties to determine medical conditions, sexual activities, vacancy patterns, general affluence, trade secrets and physical locations of occupants. 9. By intentional transmission and/or incidental disruption of house current, digital meters emit cancer-causing electromagnetic radiation, which violates laws against public endangerment, assault and commission of bodily harm. 10. Digital meters are designed to transmit using electromagnetic radiation known to cause cancer and many other diseases, illnesses and symptoms. For the above reasons, and by right of occupancy and property ownership, I prohibit, and deny consent of, any installation and use of any monitoring, eavesdropping, surveillance and radiation-emitting devices on my property and place of residence, especially in the form of a digital, transmitting utility meter. Any attempt to install any such device directed at me or other occupants on my property or place of residence will constitute trespass, stalking, wiretapping and assault, all prohibited and punishable by law through criminal and civil actions. All persons, government agencies and private organizations responsible for installing or operating monitoring devices that I consider unlawful will be fully liable for major financial and compliance claims and demands in excess of one million dollars. This is a legal notice. The liabilities and obligations listed above are true and binding upon all parties upon delivery of this notice. These terms and conditions apply without regard to status or existence of any “opt-out” contract. Under my authority as owner and/or occupant of the above property, and under your implied or expressed application to enter that property, this is an adhesion contract to which you are now bound until and unless you respond with factual rebuttal in a sworn statement by an authorized and identified party within 21 days of this delivery. Any rebuttal must show your authority to install an unlawful radiation-emitting surveillance device (digital electric “meter”) on my property without my consent. Expect rebuttal to any such claim. Any failure to timely show and prove full and binding authority to install the unlawful and harmful device on my property and/or place of occupancy will be an agreement with all terms and conditions herein. I/we deny and refuse any past, present and future proposal, offer, demand or claim contrary to any terms or conditions herein. Notice to principal is notice to agent, and notice to agent is notice to principal. Note: If a utility company has already installed a transmitting meter on your residence and you want it removed, first find out if the company allows an opt-out. If they do, simply go through the proper channels for having it removed and replaced with a mechanical meter. If opt-outs are not available in your area, Jerry Day offers a letter that demands removal at www.freedomtaker.com. Utility companies around the world have been caught lying to their customers about their smart meter programs. The following will allow you to cut to the truth with your local utility and smart meter company. Note: For additional research and resources, please see Film References and Key Issues & News. 1. Am I legally required to accept a smart meter? Answer: No. You do not have to accept a smart (or “advanced” or “upgraded”) meter. Any utility company who states this is lying. 2. Can I expect my energy bills to go up with a smart meter? Answer: Yes. Where smart meters have been deployed, energy bills have consistently risen – sometimes dramatically. The price increases will become even more pronounced once Time-of-Use (TOU) pricing is implemented. You will be charged more for electrical use when you need the electricity the most (i.e. when you come home from work or school). The idea that you will start doing your laundry at 3:00 AM when prices are cheaper is a dystopian fantasy dreamt up by the same people who think it is safe to put a toxic, microwave radiation emitting spy-device on your home. 3. In the United States, my 4th Amendment rights prevent unlawful search and seizure in my own home. Do smart meters violate these rights? Answer: Yes. With a smart meter on your home, you can no longer retreat into your own home and expect to have the privacy that is guaranteed by law. Thus, smart meters are unconstitutional and illegal. 4. Is it true that my energy use information will be sold to third-party vendors in order to market products or track my activities in some way? Answer: Yes. The California Public Utilities Commission has stated on the record that they look forward to the business opportunities that will come from selling our personal energy use data. Just like Gmail and Facebook data, your privacy will not be preserved if you have a smart meter. “I support today’s decision because it… expands consumer and third-party access to electricity usage and pricing information. 5. Will the smart meter program help the environment by reducing energy use? Answer: No. None of the existing smart meter programs has shown energy savings. In fact, having a wireless smart meter and smart grid mesh system takes more energy because now there are millions of new wireless transmitters on the grid that are constantly using energy and constantly transmitting. They all take additional energy that the grid must produce. Simple energy conservation steps by citizens would have saved much more energy, but would not have been profitable for utility companies, the smart meter industry and governments. Furthermore, any technology that harms the health of humans, plants and animals like that of microwave radiation emitting smart meters can never be considered environmentally sustainable or “green.” It is the exact opposite – an environmental calamity. 6. Have there been fires where smart meters have been installed? Answer: Yes, throughout the world there have been thousands of fires that have occurred once smart meters have been installed. This is happening because of faulty installations, old wiring that cannot handle the new meters and when smart meters have been turned on remotely. In Pennsylvania, PECO/Exelon halted their installation program because of more than twenty-four documented fires. Property damage has been significant and one man died in California because of a smart meter fire. Notably, the vast majority of smart meters are not approved or listed by UL (Underwriters Laboratories). Because of this, a fire related to a smart meter on your home may not be covered by your insurance. Norman Lambe, insurance adjuster, “The not so smart meter”, 13 November 2011. 7. Are there any known health effects related to smart meters? Answer: There are over 6,000 studies showing biological effects from the same form of radiation that smart meters invisibly emit – commonly known as “electro-smog” pollution. Additionally, thousands of people across the United States, Canada and Australia have become ill once smart meters have been installed on their homes. Medical doctors and scientists around the world are speaking out on the dangers of smart meters. Smart meters emit radiation continuously and cannot be turned off at night when radiation is the most dangerous for the body and brain. Comparatively, a cell phone – which emits radiation at levels hundreds of times lower – can be turned off when not in use. Secondly, smart meters generate what’s known as “dirty electricity” radiation pollution throughout your home, because of the switching-mode power supply that they utilize. An “opt-out” to a wired digital meter still produces dirty electricity. Only a non-digital analog meter does not produce dirty electricity. An individual opt-out still exposes you to the radiation from the neighbors’ meters and other grid infrastructure. And every smart meter in your neighborhood adds to the dirty electricity in your home, even if you opt out, because all neighboring homes share the same power substation. 8. How many pulses of radiation does my smart meter emit per day? Answer: Wireless smart meters around the world have been shown to emit between 5,000 and 190,000 pulses per day. Your utility may state they only transmit 45-60 seconds a day. This is because they are only adding up the millisecond pulses that occur constantly throughout the day. What they are not telling you is that the pulses occur every few seconds, which means that the meters are constantly emitting microwave radiation. Your smart meter is continuously communicating with hundreds of other smart meters, grid infrastructure, and in the future, all appliances in your home. The levels at which a single smart meter emits radiation can be more than 80 times higher than recommended safety levels based upon current published science. (Examples: www.BioInitiative.org, and http://www.baubiologie.de/site/english. In addition to current health risks, unless the smart meter programs are stopped, you will eventually have 10-20 appliances that each emit a pulse of radiation every few seconds in order to communicate wirelessly with your smart meter. This will fill your home with even more dangerous pulsed microwave radiation affecting your entire family. 9. Have smart meters been proven to be safe? Answer: No. The smart meter industry has not released one actual study on whether smart meters are safe for human beings. They do not want to look at something that would damage their business. This is the case even though thousands of people have become ill once smart meters were installed on their home and so much science shows that microwave radiation is dangerous. It is interesting to note that smart meters do meet federal agency “safety” guidelines. However, the FCC and others’ guidelines are not actually meant to protect our health. In fact, they are only meant to protect from acute tissue heating and electrical shock over several minutes. They are not meant to protect humans from the long-term, non-thermal levels of microwave radiation emitted by devices such as smart meters. In fact, there are no true governmental safety standards that govern smart meters. The utility company is misinformed or simply lying when they say they are safe because they meet the FCC guidelines. 10. Are utilities getting financial kickbacks for forcing smart meters on everyone? Answer: Yes. As Time Magazine has reported, in the United States eleven billion dollars of taxpayer funds (though there are reports that this is a conservative estimate) were spent as “incentives” for utilities to attempt to force the installation of smart meters upon all of their customers without their consent. As this money is divided amongst all utilities, many energy providers are actually receiving hundreds of millions of dollars in compensation, but first they have to install the meters. As this sort of incentivizing, perhaps also called bribery, is happening in similar fashion in many other industrialized countries, the multinational smart meter/smart grid initiative could potentially turn out to be the largest attempted financial scam in modern history. 1. “IEE Report finds Smart Meters Widely Deployed, Laying Groundwork for Expanded Grid Benefits,” The Edison Foundation for Electric Innovation, 2014. 2. American Academy of Environmental Medicine, Letter to Public Utilities Commission of the State of California, January 19, 2012. 3. The BioInitiative Report 2012. 5. This figure is offered in the 2013 documentary film “Take Back Your Power,” Josh del Sol, producer. 6. “Why Smart Meters Might be a Dumb Idea,” W. Kelly, Consumer’s Digest, January 2011. 8. This comprehensive list of systems within a smart meter mesh infrastructure is found in Sempra Energy Proprietary and Confidential Information, Volume I Technical and Project Plan, August 2009, published for San Diego Gas and Electric (SDG&E) in a proposal for its GridComm System. This document, describing the vast microwave mesh infrastructure needed for SDG&E’s GridComm smart metering system, was endorsed by a vendor team that includes CISCO, IBM, Arcadian and CSC. 9. “Epidemiological Evidence for a Health Risk from Mobile Phone Base Stations.” Int J Occup Env Health:16- 3, Jul/ Sept 2010, p. 263-267. 10. International Agency for Research on Cancer (IARC) press release, Lyon France, May 31, 2011. 11. “Biological and Health Effects of Microwave Radio Frequency Transmissions, A Review of the Research Literature: A report to the Staff and Directors of the Eugene Water and Electric Board,” Paul Dart M.D. et al, June 4, 2013. 12. “The ‘Medusa’ Meter—A Bigger Unsafe Meter for Preferred Customers,” stopsmartmeters.org. 16. Assessment of Radiofrequency Microwave Radiation Emissions from Smart Meters, Sage Associates, Santa Barbara, California, January 2011. 17. “Smart Meters Violate FCC Radiation Exposure Limits Says New Study,” Stopsmartmeters. org. 2012. 18. Tantalus News press release, December 19, 2013: Inland Power and Light Turns to Tantalus and Itron for Smart Grid Communications Network. 19. “Hackers Use Refrigerators and TVs to Launch Cyber Attack,” Electronic Products.com, January 17, 2014. 20. EMF Safety Network, See: Smart Meters at emfsafetynetwork.org. 21. “Now Radio Waves coming from your Faucet?” Texans United Against Smart Meters, January 2, 2013. 22. Initial comments submitted January 17, 2014 on behalf of Northeast Utilities in response to smart meter proposal issued by the Massachusetts Department of Public Utilities of December 2013, DPU 12-76-A. 24. “A Hacker’s Dream: Smart Meters have Security Holes,” Associated Press, March 28, 2010. 26. “Connecting Dots: US Patent Office Admits Energy Suppression,” Josh del Sol, thebigpitcher. org, September 2012. 28. “Smart Meter Interference,” Martine Victor, The Manchester Journal, March 14, 2013. 29. “Why Smart Meters Might be a Dumb Idea,” W. Kelly, Consumer’s Digest, January 2011. 30. A good site for exploring the nuisance of an oppressive environmental hum heard by many across the nation is Sandaura’s Blog at sandaura.wordpress.com. This blog features testimonies from people who can hear various radio frequency hums, standing waves, and droning sounds believed by many observers to be emanating from many smart grid networks. 31. How Smart Meters Can Cause Autism and Cancer, Dr. Andrew Goldsworthy, MCSA News, Volume 6, Issue 8, 2011. 32. Bibliography of Reported Biological Phenomena (Effects) and Clinical Manifestations Attributed to Microwave and Radio Frequency Radiation, Zorach R. Glasser, Naval Medical Institute, National Naval Medical Center, October 1971, AD 750271. 33. 312 References on Electrosmog, Fertility and Reproduction published by EMF Safety.org. This is a comprehensive bibliography of scientific studies showing deleterious effects of electromagnetic fields on fertility and reproduction, last updated June 2012. 34. “Findings in Autism (ASD) Consistent with Electromagnetic Fields (EMF) and Radiofrequency Radiation (RFR),” Martha Herbert, Ph.D., M.D., Pediatric Neurology TRANSCEND Research Program Massachusetts General Hospital and Harvard Medical School. This paper was prepared for the BioInitiative Working Group December 2012. 35. Initial comments submitted January 17, 2014 on behalf of Northeast Utilities in response to smart meter proposal issued by the Massachusetts Department of Public Utilities of December 2013, DPU 12-76-A.